For many casual Scrabble players, drawing a Q is more likely to inspire fear rather than joy. But the 10-point letter should be seen as a source of high-scoring plays. Learning the 33 words which use a Q but not a U (or use both, but not in the QU sequence) can go a long way toward improving your results. You might also want to learn Scrabble's legal two-letter words and words with no vowels. 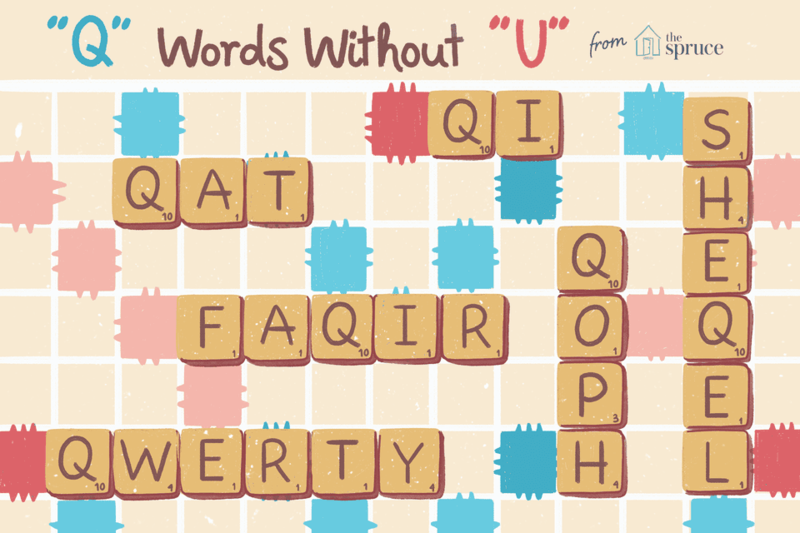 Here are all of our Scrabble word lists and some simple ways to improve your Scrabble play. Merriam-Webster's Official Scrabble® Players Dictionary, Fourth Edition (OSPD4). For club and tournament play, it is the Official Tournament and Club Word List, Second Edition (OWL2), also published by Merriam-Webster, Inc., and sold exclusively through www.wordgear.com. It is derived from the Official Scrabble® Players Dictionary, Fourth Edition, supplemented with nine-letter words and their inflected forms taken from Merriam-Webster's Collegiate Dictionary, Eleventh Edition (MW11). This book contains words only, no definitions or part-of-speech labels, and includes all inflected forms spelled out in full. If you're playing Scrabble without a paper version of the dictionary by your side, you can challenge and check words online. Hasbro offers both a word checker and a word builder on its site (though of course the word builder can only be used when not playing competitively). These words are legal according to the Official Scrabble Players Dictionary, 4th Edition. They may not be legal if you use a different dictionary. The word list used in tournament games in the United States is known as the Official Tournament and Club Word List, created by the National Scrabble Association.